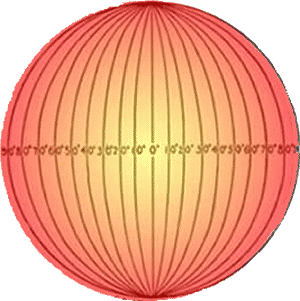 The grid of intersecting lines on a globe enables us to identify every location on earth with a set of numbers or letters The ancient Babylonians divided any circle or sphere into 360 degrees. The symbol for degree is °. Ptolemy was a Greek thinker who borrowed the Babylonians’ ideas as he wrote one of the first books on geography. Ptolemy wrote that the furthest point at the right or left side of a circle or a sphere is 90 degrees from the top. 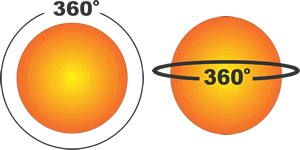 There are 180 degrees between any two sides of a circle or sphere. This means that the north and south poles are 180 degrees apart from one another, and both poles are 90 degrees from the equator. Geographers use Ptolemy’s calculations to create Lines of Latitude and Lines of Longitude. Lines of Latitude are imaginary lines that circle the globe from east to west. Lines of Latitude are called parallels because the lines parallel, or run in the same direction as the equator. 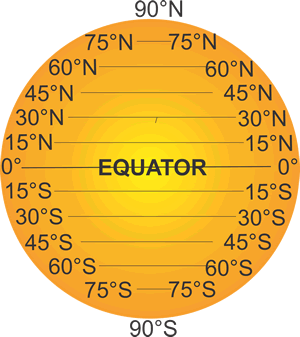 The equator is the imaginary line that is as far away from the North Pole as it is from the South Pole. Lines of Longitude intersect the equator at right angles but end at the North and the South Poles. Lines of Longitude are also called meridians. 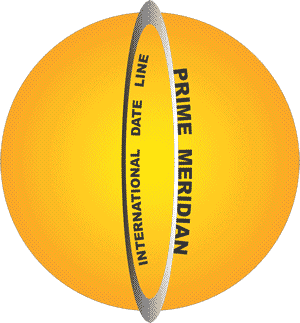 Meridian comes from a Latin word that means midday. The sun crosses each meridian in the middle point between sunrise and sunset. In 1884, the International Meridian Conference chose to make the line at 0° longitude run through the Royal Observatory in Greenwich, England, though they could have chosen any spot on earth. They called the line at 0° longitude the prime meridian. Meridians are counted east and west from the prime meridian. St. Louis, Missouri is 90° west of the prime meridian, so it is one-fourth of the way around the earth from the prime meridian. The International Date Line is 180°–as far away as possible–from the prime meridian. When it is noon along the prime meridian, it is midnight along the International Date Line. 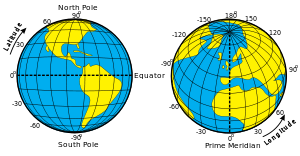 Geographers also divide the earth into hemispheres. Hemi- is a prefix that means half. Everything north of the equator is in the Northern Hemisphere while everything south of the equator is in the Southern Hemisphere. The Western Hemisphere is west of the prime meridian and the Eastern Hemisphere is east of the prime meridian. The hemispheres both end at the International Date Line. The United States is in the Northern and Western Hemispheres. The White House in Washington, D.C. is 80 degrees west of the prime meridian and 26 degrees north of the equator, or 39°N,77°W. You can have one foot in each hemisphere by standing in this monument in Kayabwe, Uganda. Watch Mr. Dowling’s Powerpoint presentation on Longitude and Latitude. Find the longitude and latitude of your home or school at World Atlas. The ancient Babylonians divided any circle or sphere into 360 degrees. Lines of Latitude circle the globe from east to west. The line at 0° latitude is called the equator. Lines of Latitude are called parallels because the lines parallel, or run in the same direction as the equator. Lines of Longitude intersect the equator at right angles but end at the North and the South Poles. The lines that run between the North and the South Poles are called Lines of Longitude, or meridians. The line at zero degrees longitude is called the prime meridian. 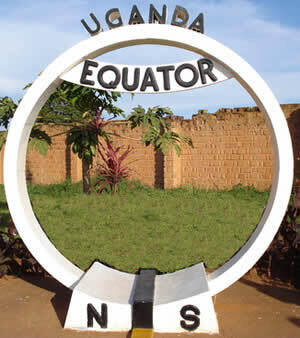 The equator is the imaginary line that separates the Northern Hemisphere from the Southern Hemisphere. If you are facing the prime meridian, the Western Hemisphere is on the left and the Eastern Hemisphere is on the right. If you are facing the International Date Line, the positions are reversed. The Eastern Hemisphere is on the left and the Western Hemisphere is on the right. If someone were to ask for the location of the Empire State Building, you might answer that it is at 350 5th Ave, New York, New York in the 10118 zip code. It probably wouldn’t be very helpful, but you could also truthfully answer that the president lives precisely at 40°45’04.35″N, 73°59’10.17″W. These are examples of absolute locations. It is often more helpful to describe your relative location. For example, the Empire State Building is 25 blocks south of Central Park. We could also say that the Empire State Building is across the street from McDonalds. (It really is!) Both absolute and relative location are useful tools for geographers, and we will use both throughout our study.